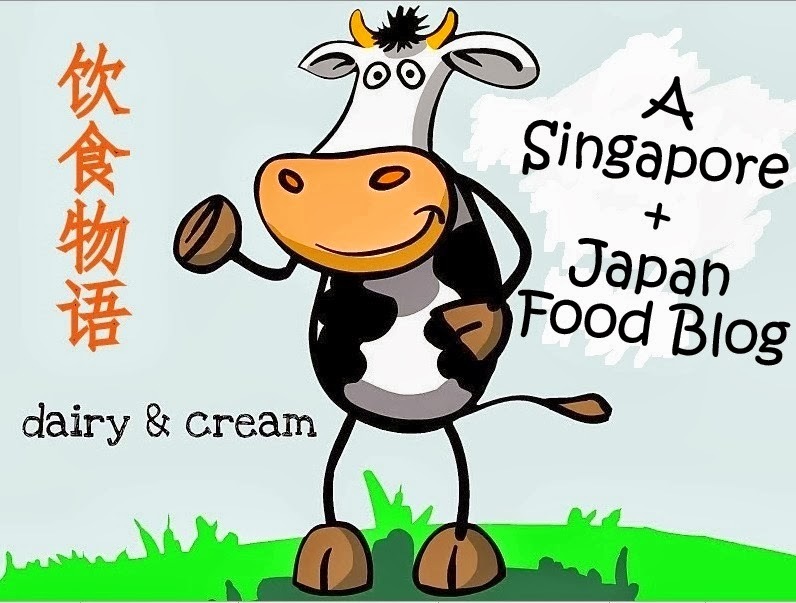 Singapore Japan Food Blog : Dairy and Cream: Domino's Pizza : Mesmerizingly Mediterranean! Are you a pizza lover or someone who usually rings for pizza delivery because you just don't feel like getting out of your house? It's the perfect time to try Domino's Pizza if you have not yet done so. Domino's has unveiled 4 new delicious Mediterranean pizzas, specially created by Chef Julie (above pic) that is only offered in Singapore and for a limited period of time! The first newly introduced sauce  is the Napolitana, made with a blend of onions, tomatoes, garlic and herbs to give the pizzas a tangy and punchy edge. This sauce is paired up with lovely cherry tomatoes, fresh prawns, Belgian spinach, caramelized onions to construct the Portofino Prawn Pizza. Spicy lovers should not miss the Diavola Beef which contains red capsicum, onion and red pepper flakes--ingredients loaded with phytochemicals that are good against cancer. I loved how this Napolitana sauce-based pizza triggered a burning sensation on my tastebuds without having to resort to packaged chilli flakes. Too much of Napolitana sauce? Have a slice of the Pesto-based Basilico chicken pizza. The aromatic sauce is made of basil, cashew nuts and vegetable oil. In fact, the use of herbs and spices in Mediterranean food is what draws me to the cuisine because this method enhances the natural flavours of meat without over-relying on seasonings. If you are on a meatless diet, try the Romano Margherita (Napolitana Sauce base), a simple yet delectable pizza topped with feta cheese, cherry tomatoes and olives. To try these new creations without breaking your wallet, grab the 2 Regular-sized pizzas for $22 deal (save 50%!) or 2 Large@$33 by choosing from 9 flavors (4 Mediterranean + 5 Popular : Hawaiian/Pepperoni/Very Veggie/ Classified Chicken/Simply Cheese). Step 1. Choose the crust: the New York, a crispy hand stretched crust, is best recommended for Mediterranean pizzas; Cheese Burst (a sinful indulgence of creamy cheddar cheese sauce in between two crust); Crunchy Thin(for the least bloated) ; Classic Hand Tossed. Step 2. Choose the size (personal/reg/large) and type of flavour. Step 3. Add on sides at special prices for any minimum purchase of personal pizza. From the savoury selection, the Tom Yam Chicken Crunchies($6.80) served with thick cheese sauce and Garlic Cheese Onion rings ($2.80) are some of the noteworthy dishes that I personally recommend. But do note that crunchiness tend to be compromised in delivery food. Otherwise, order the Sweet Sides to end your meal on a sweet note. At $3.80 each, the Caramel Cake, a warm sticky date pudding that would be ideal with more sticky toffee sauce as it dried up easily. The molten chocolate lava cake lived up to its name with its generous amount of gooey lava that reminded me of Morgansfield's version. In fact, I was honestly impressed by the quality of Domino's desserts, which are comparable or even better than some fine-dining places. Conclusion: For a maximum variety of tastes, I recommend the Napolitana sauce-based Portofino Prawn on Cheese Burst crust and the Pesto sauce-based Basilico Chicken on New York Crust, though both are coincidentally "first class" pizzas ($4 surcharge each) and cheese burst crust calls for extra $4. They just had the right mix of flavours and dough textures that justify the extra price tag. For more savings, order via the free Domino's iPhone App ("shake" phone to enjoy a free side) or website. You can choose the time, date of delivery, and check the status of ordered items via the GPS Tracker (aka. Great Pizza Service Tracker). Alternatively, there are 14 outlets for takeaway or dine-in. With Nth number of pizza permutations you can play with, I am sure you can find one that you like. Please remember to share your favourite pizza on my facebook page as I would love to try it! Thank you Janet and Alvin from omy.sg and the Domino's Pizza Singapore for the invite.